I needed to visit the post office in Woolton Village this morning, to catch it before they close for the Saturday half-day closing. I’d usually park the car in Sainsbury’s car park and then walk up to the village but needed to get in and out as quickly as possible, so I chose to leave the car in the Woolton duck pond. 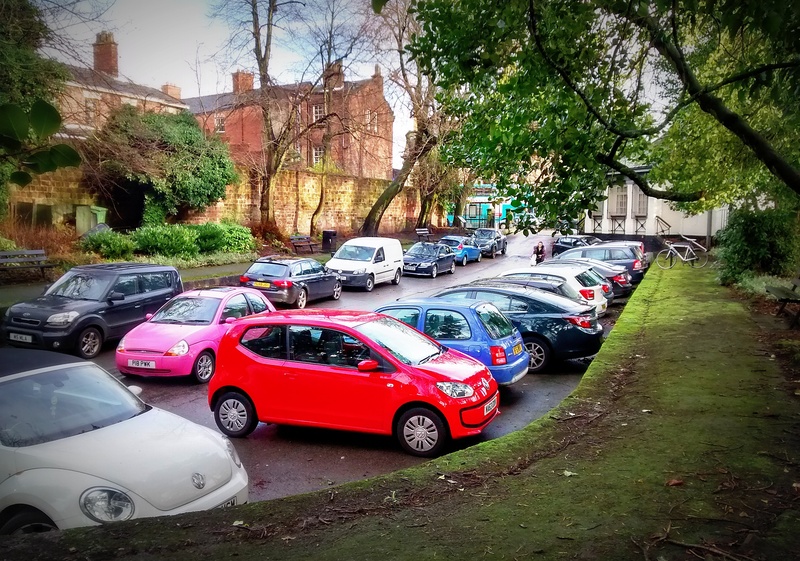 It was packed (as usual), with vehicles being parked as close as possible to the next, and in every space to be seen, to leave just enough room for a driver to squeeze their Fiat Punto in. Happily though, a larger space was available at the bottom (the last one) and I managed to squeeze my Insignia in there. Thank goodness for front and rear parking sensors! Anyway, I did the deed in the post office and headed back to the car, and as I walked back I was reminded of the older photos seen below which I’d seen recently on some of the popular Liverpool history Facebook pages. They were taken during a period when everything moved relatively sedately, and instead of being filled with cars, the pond was actually filled with water, a fountain and wildlife. People used the area for recreation – to take a stroll and walk around; to feed the creatures which existed there, and sit on the benches and relax – pondering the rest of the world and its troubles or nothing as they saw fit. Well I suppose the bird feeders are still dotted around. Visitors also leave little heaps of nuts out for the squirrels if they happen to pass. There is also plenty of greenery left at the bottom end to draw in the wildlife once spring returns. Even the benches are still there, albeit not the original ones. But unfortunately, not a single duck was to be seen. Instead I spied several Vauxhall’s, a Ford, a brace of VW’s and even the odd Audi…but alas, no ducks. I pictured myself sitting on one of those benches in a different time – closing my eyes to listen to the singing of the birds, the water droplets falling back into the pool from the fountain, the clatter of the hooves of the horses on the damp cobbles as they pulled a brewers dray, the peal of the church bells at St Peters calling everyone to the Sunday morning service. And then I opened my eyes and watched a pink Ford Ka trying to insert itself into a tiny space – I think that could be commonly called ‘crashing’ back to reality. Oh well! No use bringing the grand-daughters here to feed the ducks. I suppose it will just have to be Calderstones Park again! All content copyright G.Seaman (2016). 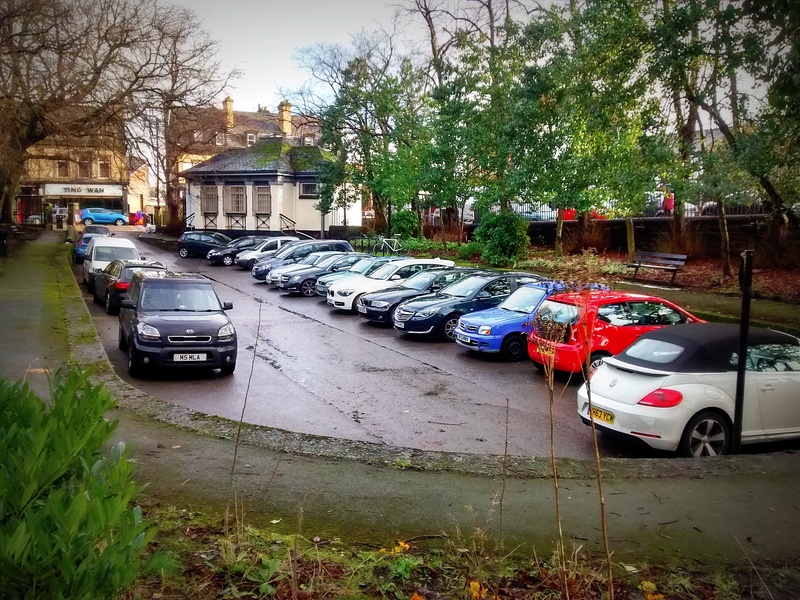 This entry was posted in Photography, Writing and tagged "Woolton Village", car parking, duck pond, ducks, Liverpool, local history, st.peters church, victorian, water fountain, woolton. Bookmark the permalink.